Modern warfare: How well could troops fair against medieval knights? 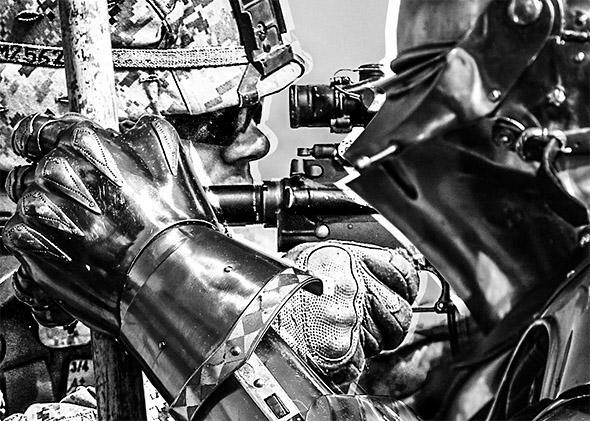 Could Modern Troops Defeat Medieval Knights in Hand-to-Hand Combat? So we want to see what the epic ending to a battle between two of time’s most deadly warriors will be? Actually, it’s not that interesting. The Marine, my chosen analog for this question, loses, and that is actually not all that surprising. Today, Marines have a great deal of hand-to-hand combat training relative to other modern military units. The Marine Corps even created its own style of martial arts centered on combat called the Marine Corps Martial Arts Program. All recruits are given some degree of martial arts training and knife combat skills in boot camp and then receive far more once they reach their actual units that they will be deployed with. Still, that doesn’t begin to compare to how much training in hand-to-hand combat a knight would have received. Since they were brought up as warriors from an early age, and—ignoring, I suppose, bows and arrows—no other forms of combat training existed, they have the edge. Remember also that even the best Marines weren’t Marines until they became adults. A knight was born into a military contract with his lord, exchanging martial obligation for family lands and wealth. Unless they served a more important role for some important skill, like running the country, most all the nobility were part of a warrior class, passing knowledge down through many generations. I won’t insult your intelligence with this one. The Ka-Bar is a good knife. It’s not a good sword. The Marines today use variants of the Interceptor body armor system. It is a good system. It provides ballistic protection that can stop a 9 mm round across almost the entire body and added protection for vital areas like your abdomen and chest. Equipped with ceramic plates that can be installed into the equipment, the armor can stop even far larger rounds. There is even the amazing, well-documented case of an Army medic in Iraq who was fired upon by an insurgent sniper, knocked down, got back up, and ran for cover. That story gets even more interesting because the sniper was unaware of the troops just beyond his view. They stormed his location and critically wounded the insurgent. Who came to save the insurgent’s life? You guessed it, the medic. Here is the video footage of the armor being used. The Interceptor armor is pretty amazing. There are better options, but it is responsible for saving thousands of lives. The armor is also very light weight relative to the amount of protection it gives. Trust me—I had to wear them for years. They have a very good range of motion, and the Marine would be able to move far better than the knight, even given that there are many misconceptions about the mobility of knights. They could move better than you think, but in this case, not as well as the armored Marine. That said, ballistic protection and defense against a sword are two different things. A sword could pretty easily hack the Interceptor armor with only a few swings, provided he hits, which he eventually will. The Interceptor armor also isn’t designed to intercept a blow from a large-edged weapon. It is, after all, made of various amounts of cloth. Practically speaking, it provides almost no defense, in this case, at all. Meanwhile, the Marine is going to have to use a knife to find a few weak points in a knight’s armor. I know, right, Go for the eye holes! and See if he has armor on his legs! But try to understand that this Marine has a very angry and virtually impregnable man swinging a sword at him. There are almost no practical methods for this man to overcome a knight, tactically speaking, from a melee standpoint. Perhaps, if he is clever, given a fight to the death, he will stay out of distance of the swings and exhaust the knight. Of course, the Marines aren’t trained for this sort of encounter, so that is hoping the Marine is clever. And lest we not forget, a clever knight will just take his time and follow slowly until he is able to corner our wayward modern warrior. Given all these—training from an earlier age, focus on melee combat, more practical weapons, better armor for the fight—I see no realistic reason to see why a modern warrior would win this one. That isn’t a bad thing, though. What needs to be understood is that a Marine is today’s elite combat unit. The Marine’s practices, weapons, and armor are designed to combat today’s challenges better than any other group of its size. A knight is the equivalent, but for a different age. To compare the two is not appropriate because they have been specialized for hundreds of years to do a certain job a certain way in relation to the tactical capabilities of the enemies they fought. They were made to be better than anyone else of their times, but not against each other. Don’t get me wrong, I love talking about my fellow Marines and the amazing things they can do, but questions like this were not meant to favor the Marines or any other modern warrior. In 800 years, a similar question may be asked: Who would win between a space commando and a 21st-century Marine if the space commando can’t use his plasma swords, photon blasters, cybernetic power suits, or holoshields? I am pretty sure we will do well in that one. Battle Tactics: How would ancient Greece battle tactics fare against medieval European and Arabic armies? Military History and Wars: What were the reasons for France’s poor military performance during the Second World War?